Incorporating the spirituality of work into liturgy is one of the best ways to help people understand and celebrate it. One way to do so is through preaching, as encouraged on the weekly pages. But there are some other creative ways to make the connection in liturgy. The lectionary and Roman Missal include "Masses and Prayers For Various Needs and Occasions," one of which is "For the Blessing of Human Labor" (Lectionary #846-850; Sacramentary: Masses and Prayers for Various Needs #24). The lectionary offers multiple options for each reading and the sacramentary offers prayers focused on labor. The readings for the feast of St. Joseph the Worker correspond with work (Lectionary #559). We have also made connections to the Lectionary readings this September through October (see the weekly leader pages). Invite parishioners to come to Mass wearing the clothing they wear in their occupation: what they wear most in their Monday through Saturday ministry. This is a great way to help people connect their faith and worship with their work during the week. It is a way for everyone to bring their "work selves" with them to Mass. Students: Wear your school uniform or any clothing identifying your school. Unemployed/seeking work: Wear either what you would wear in the job you are seeking or to an interview. Retired/homemaker/full-time parent: Wear whatever you wear in living out these roles. One could also wear clothing associated with a significant part-time role, either as paid work, volunteer work, or a hobby. Since the occupation will not be obvious from all clothing, consider providing name tags for everyone, to list their first name and occupation (and optionally place of work). Inviting members of your community to bring physical tools of their work is an opportunity for them to offer them for the mission of the Church. They may be displayed, processed up, and and/or blessed. Depending on logistics and the size of your congregation, representative tools could be offered on behalf of the community, instead of asking everyone to bring their own. But ideally this will get everyone involved! It is desirable that the participation of the faithful be expressed by members of the congregation bringing up the bread and wine for the celebration of the eucharist or other gifts for the needs of the Church and the poor. This makes it a natural time to bring forward work symbols, as described above. It is also a part of liturgy that talks about our work explicitly. through your goodness we have our time and skills to offer. Fruit of our lives and experience. They will become tools to be used for your glory. Additional prayers may be offered, either directly for the assembly in support of their role in the world or for broader intentions. 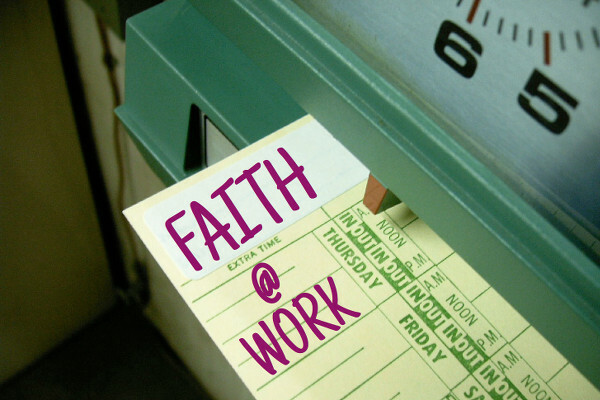 Consider how to address work-related intentions in the Prayers of the Faithful, especially for social justice. and are still working for us today. to take the rest that we need. that you need done in our world. and that our work matters to you. We pray this in Jesus' name. Be sure to take pictures so you can use them to promote the parish (on the website or in articles). Since this is an interesting idea that is not commonly used, use it as a way to promote the parish. Get an article in the diocesan or community newspaper. Since it is so daily life oriented, it is a good opportunity for parishioners to invite friends to liturgy, especially less engaged Catholics. They may be more willing to extend an invitation the following year after seeing how it works. Labor Day weekend, or the Sunday before or after, is a natural time to honor work in the United States and Canada (where the letter "u" is added). However, because many travel over the Labor Day weekend, it can be a challenging time to celebrate it. The Feast of St. Joseph the Worker (May 1). This optional memorial has long been associated with work, and the assigned lectionary readings reflect that. Learn more about this feast here. International Worker's Day also falls on this day and is the equivalent holiday to Labor Day in many other countries. Creator God, the Scriptures are full of your image as Builder and of your mandates to us when we would build. We ask your blessing this day on all who are builders and contractors by trade or profession. Inspire them with commitment to quality and safety, with a right care for their workers, and with the fortitude to make it through times of no work and little pay. Help them balance their many loyalties--to contracts, to customers, to workers, to suppliers, to laws, and to their own families and selves. May they know and find their ministries in the footsteps of the carpenter of Nazareth. In his name we pray, Amen.